This is the smallest batch of canning we have ever done. Tiny Mexican Gerkins have been a favorite if elusive veg to grow. Last year, we finally got several plants up and blooming, but they proved to be irrestible to everyone that passed. They picked the darling little cukes and popped them immediately into their mouth. This year, we were determined to grow a bumper crop. Alas, not a single plant grew. Then, in August, a single plant popped up, and a few cucumbers hung on the vine. As the threat of frost grew, the entire 18 cucumber harvest took place. As planned last year, we made pickles. Simple refrigerator pickles. The 18 cukes, sometimes called "mouse melons", fit into a spice jar. Into a saucepan we put one jar of vinegar plus one jar of water and half a jar of sugar, bringing to a boil. 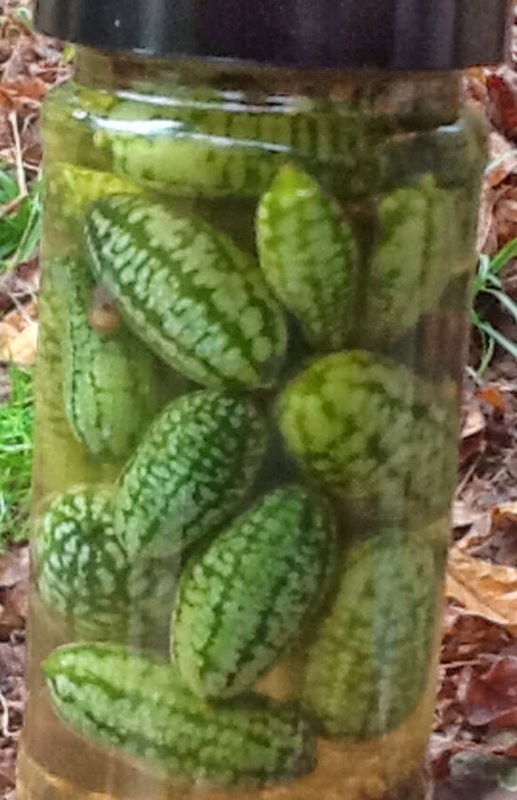 A bit of pickling spice was added to the bottom of the jar with the cucumbers and the boiling brine filled the jar. It was capped and allowed to cool before being placed in the refrigerator. It should make a nice condiment for Thanksgiving. I found the link to this from a Modern Farmer article on these cukes. Do you know where I can get seeds? Thanks! I get mine at Territorial seeds. Johnny's seeds also has them. Don't give up! Next year you'll be picking them by the bucketfuls!